Admittedly, I do not know much about art. As a child I remember poring over a children’s art history book, and I distinctly remember reading about some artists and their works; Van Gogh’s Starry Night, the ballerina sculpture by Degas, the picnic scene by Mary Cassatt. Many years later, I find myself in Musee D’Orsay, where a lot of the works from my children’s book were housed. 🙂 This museum, I daresay, has such a very high concentration of popular and important works of art in a relatively small space. I say “relatively small,” because compared to the massive Louvre, it is small at 170+ meters, and you can see all exhibits in about 2-3 hours. 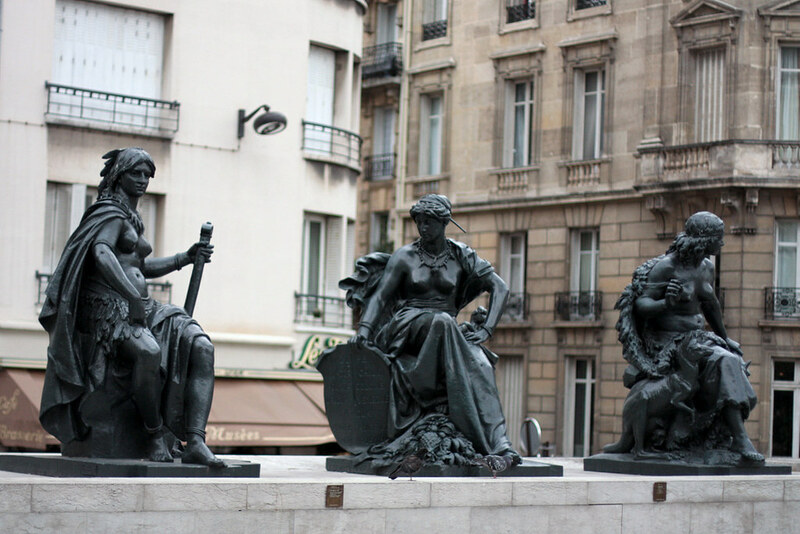 Most displays in the Musee D’Orsay holds mostly French art from 1848 – 1914. Built in 1900, the building used to be a train station– the Gare D’Orsay. 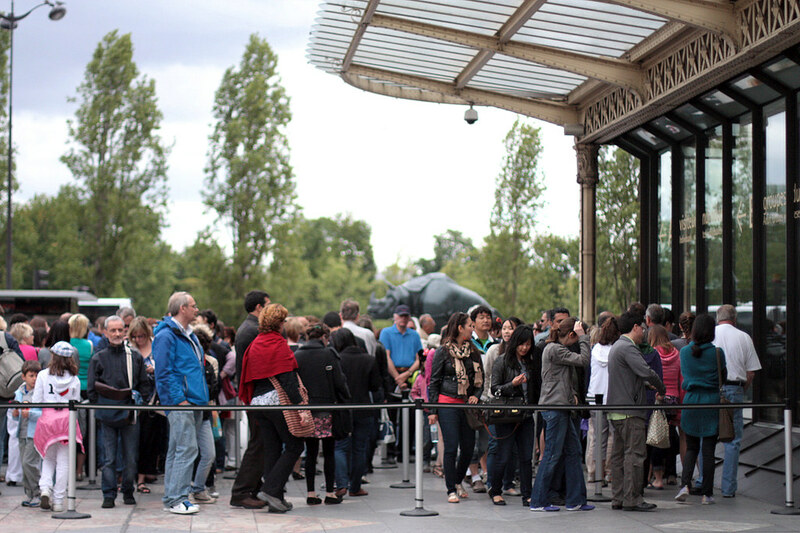 The “normal” queue to the museum. We were in a faster-moving one as we had very convenient Paris Museum Passes. Photos weren’t allowed inside, and I didn’t dare break the rule, because of some irrational fear of sounding off an alarm or something like that. I’ve been to museums (in Vienna) where alarms would go off when you come too close to the display. In the future, I should bring a small, unobtrusive point and shoot for times like these. Museum interiors: photo from Wikipedia. Unfortunately, a part of the museum was under renovation during our visit, the clock (horloge) included. I was so set on sneaking some shots from the clock, only to find out it was all boarded up. Some favorite & memorable pieces: La Source (Ingres), Whistler’s Mother (Whistler), Petite danseuse de quatorze ans (Degas), Self-portrait (Van Gogh), The Artist with the Yellow Christ (Gauguin), Blue Water Lilies (Monet) , Dance at Le Moulin de la Galette (Renoir), Starry Night (Van Gogh – but not the more popular one on my bucket list, which is in MoMA in New York), Olympia (Manet). Really enjoyed looking through almost everything at Musee D’Orsay, even if we were very cold (didn’t dress appropriately for the day’s weather) and hungry. We head to Rue Cler to have late lunch at Café du Marche. ha ha ha! i have an exact same photo of that clock. 🙂 i love the musee d’orsay. you get the best store photos! like that one in the fruit grocer’s. so cool. hey, i decided to reply here instead! i use a kindle touch. it’s black and white and i think no frills. and yes, i do like it because i get to put it in my small purse and it’s easier to read outdoors in the sun, no glare and so on. it is slower to load compared to iBooks on the iPad, but i got used to it quickly. it’s easier to read pdfs on the iBooks because you can adjust the size of the page as opposed to that on kindle. but overall, i think i will use it for airplane novels, quick reads for when i have a few minutes to steal here and there. i think having trad books is still best for your favorite stuff. but really, having left hundreds of books behind (for good or in storage) through the years has made e-readers a more sensible alternative for me. i hope this helps!